Filipinos are known for being the most hospitable people in the world. But surprisingly we didn’t do well in a 2006 Canadian Reader’s Digest survey on gratitude. Among the 35 major cities worldwide, Manila placed only a mediocre 22nd, while cities such as Toronto, Zurich, and surprisingly New York took the third, second, and top spots, respectively. Because of this result, Toblerone spearheaded the “National Thank You Day” initiative. This eventually led to Mayor Alfredo Lim officially declaring October 20, 2007 to be Manila’s first “National Thank You Day.” In 2009, the day also saw the celebration of the first Thank You Day Awards where Filipinos recognized former President Corazon Aquino as the person Filipinos should be most grateful for. Thus we are celebrating our 4th National Thank You Day on October 20, 2010. Seeking to further embrace the idea, Las Pinas City Representative Cynthia Villar proposed House Bill 5466, which aims to designate October 20 as a national holiday. This was supported by her husband, Senator Manny Villar, who has filed the Senate Bill 1106 for the same purpose. Last September 2009, I held a contest (Spread the Sweetness of Gratitude Photo Competition) here on my blog sponsored by Toblerone. The result of the contest was revealed in a National Thank You Day celebration. There are so many things we should be grateful for, even for the little things that others do for us. But why is it sometimes people have difficulty saying "thank you"? If we would always say "thank you," how many smiles we would see spreading around and making people happy. It is the goal of Toblerone to saying 'thank you' as a habit among Filipinos. If this becomes a habit, people will have more genuine respect and appreciation of each other. Therefore, pride, anger and other negative vibes can be prevented. Toblerone believes in that world, and supports the initiative to make “National Thank You Day” an official day in the Philippines. The brand, known for its signature triangles of smooth Swiss chocolate wishes to encourage Filipinos a mindset of camaraderie, collectiveness, and harmony. It also aims to make us appreciate each other’s contributions to our everyday experience, not just on October 20, but every day. Begin 365 days of gratitude. Help out by doing your part. All it takes to start is to smile, and say “Thank you.” Spread the good vibes with Toblerone, the official “Thank You” chocolate of the world. It’s time make the world a more thankful and happier place. 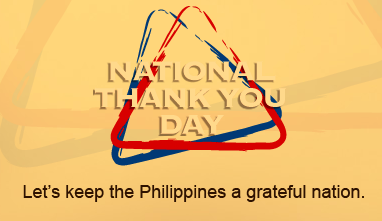 To find out how to make October 20 the National Thank You Day of the Philippines, visit http://thankyoudayphilippines.com and sign the online petition. Submit an entry to the Toblerone's Thank You Museum for the things that Filipinos should be grateful for.